Shanghai, as the largest city in China, has the reputation of “the Paris of the East”. It is not only an economic center but also a famous cultural city with a deep modern urban culture and numerous historical sites. If you want to know about the modern China, Shanghai is a must-see place you need to visit. So what are the top 10 things to do in Shanghai? Where are the most interesting places to visit? Let’s have a look! The Bund of Shanghai is located along the Huangpu River, with a total length of about 1.5 km (0.9 mile) from the Waibaidu Bridge to Nanpu Bridge, which is the most symbolic scenic spot of the city. The Exotic Building Clusters consists of 52 classical buildings of different architecture styles including Gothic, Baroque, Romanesque, Classicism and the Renaissance. These buildings were not from the same designer nor built in the same period, but they do have a unique harmonious beauty. One of the best things to do in Shanghai is to visit these resplendent buildings. You can experience the various art of architecture meanwhile knowing about China in modern times. After seeing the Exotic Building Clusters, cruising along the Huangpu River can be a romantic thing to do in Shanghai at night. In the twilight, the neon lights shine on both sides and reflect each other, traveling on the Huangpu River by ship will give you a profound impression. On the east side, you can see modern skyscrapers. On the west side, you can appreciate the splendid Exotic Building Cluster in the distance. That will be a really unforgettable experience. In Pudong new area, stands the tallest building in China and the second tallest of the world, Shanghai Tower. The total height of the building is 632 meters (2,074 feet). The appearance of the building is spirally upward, symbolizing the shape of Chinese dragon. Standing on the 118-story sightseeing hall, you can have a close look at the Oriental Pearl Tower, Jin Mao Tower and the World Financial Center while overlooking the whole city. Thus you can understand why it lists on the top 10 things to do in Shanghai. Having fun in the Disneyland must be the best thing to do in Shanghai with kids. This is the first Disneyland Park on China’s mainland, which is located in Pudong new area. Here you can experience many "firsts" of the Disneyland including the largest Disney castle, the first pirate theme park and the longest Disney parade route. No matter, children and adults can find the joy in this magic kingdom. In addition, it is recommended to avoid peak hours such as holidays and weekends. If you can only go in these times, probably you will need to join long queues. Another must thing to do in Shanghai is shopping in Nanjing Road. From the West Yan'an Road in the west to the Bund in the east, the Nanjing Road Pedestrian Street lined with different shops stretches around 1,200 meters (1,312 yards). As the most prosperous street in Shanghai, here you can buy products from all over the world. Besides the famous shopping malls, some classic restaurants of authentic local dishes can also be found. It is really a piece of good news for someone who has a passion for food. 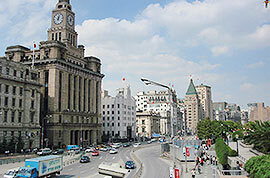 Walk to the end of Nanjing Road, you will reach the beautiful Bund. Yu Garden is a classical, delicately designed garden with a history of more than 400 years. It’s one of the must-see places in Shanghai. The garden is not far from the Bund and the tranquil and beautiful environment is very attractive. Here you can see pavilions, rockeries and ponds in typical architecture style of South China gardens. Besides, you can appreciate the Chinese calligraphy and inscriptions of past masters. What’s more, Yuyuan Tourist Mart, outside of the garden, is a very busy district with various souvenirs and snacks. If you are a foodie, then you are welcome to enjoy one of great but cheap things to do in Shanghai in the snack street near the Old City God Temple, which is connected to the Yuyuan Tourist Mart. You can taste nearly all kinds of local snacks here, such as Nanxiang Steamed Stuffed Buns, Chop Rice Cakes, Vegetable Stuffed Buns, Crab-Yellow Pastries and Cream Spiced Beans. And don’t forget the Fried Stuffed Buns, when eaten with Beef Vermicelli Soup, they're really delicious. Speaking of free things to do around Shanghai, Tianzifang is a must-see place. It is converted from the unique local Shikumen complex which is a type of traditional residence combining the western and Chinese characteristics. The block is the work base of many litterateurs and artists. There are some unique boutiques such as vintage glasses store and old-fashioned music boxes shop, as well as trendy clothing stores from Hong Kong. In addition, you can find some interesting and creative restaurants here. This place is certainly one of the best places to visit in Shanghai. After a busy day's traveling, having a drink in Hengshan Road is one of the definite top things to do in Shanghai at night. As the most widely reputed street of leisure and entertainment in Shanghai, Hengshan Road is famous for the bars of different styles. Relaxing yourself and chatting with your friends here can be really enjoyable. In addition, on both sides of the road there are lush French sycamore trees and the distinctive upscale European buildings in the shade. Zhujiajiao, one of the city's four historic towns, is a definite place to visit near Shanghai. It is a typical ancient water town in the south of the Yangtze River. The town is crisscrossed with various water ways and there are several bridges with different shapes as well as numerous interesting stores. You can choose to stroll around the town on foot or by boat to experience the local customs and appreciate the ancient buildings. By the way, the traditional snacks are also very tasty. Any good dim sum place around Shanghai Marriott city centre hotel? Old Shanghai Taste Restaurant, located at No.720 East Nanjing Road is recommended to you.